Barrett, R., and Herndon, J. (2005), Safety First: Key Safety Considerations When Drying Biosolids to Class A Specifications, Water Environment and Technology, Vol. 17, No. 4, p. 35. Craven, A., et al. (2004), Largo's Beneficial Use of Biosolids, Florida Water Resources Journal, April, pp. 42-44, 46, 48. Currents, a U.S. Filter newsletter (2002), Vol. 1, No. 1, September. Karmazinov, F. V. (Ed.) (2002), Wastewater Treatment in Saint Petersburg, New Magazine, Saint Petersburg, Russia. Kowalski, D., et al. (2002), Benefits of a Progressive Centralized Biosolids Management System, Florida Water Resources Journal, April, pp. 31, 32, 39, 40. Lide, D. R. (1995-1996), Handbook of Chemistry and Physics, 76th ed., CRC Press, Inc, Ann Arbor, MI. Lue-Hing, C., Zeng, D. R., and Kucherither, R. (Eds.) (1992), Water Quality Management Library, Vol. 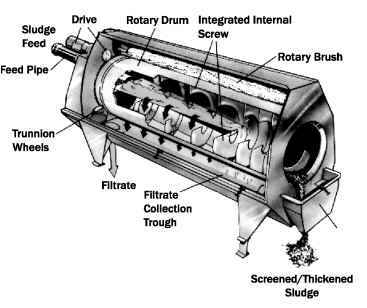 4, Municipal Sewage Sludge Management: Processing, Utilization and Disposal, Technomic Publishing Co., Lancaster, PA.
Olson, R. T., and Bohman, R. T. (2001), Class A Biosolids: Simultaneous Dewatering and Pasteurization Using an FKC Screw Press, company brochure, FKC Co., Ltd, Port Angeles, WA. Outwater, A. B. (1994), Reuse of Sludge and Minor Wastewater Residuals CRC Press/Lewis Publishers, Boca Raton, FL. Pelletier, R. A., et al. (2001), To Lime or Not to Lime, That Is the Question, Florida Water Resources Journal, February, pp. 37, 38, 40. Pennington, R. (2003), Pollution Equipment News, June, p. 37. Samokhin, V. N. (1986), Design Handbook of Wastewater Systems, Vol. 2, Allerton Press, New York, pp. 587-606. Shimp, G., and Childress, B. (2002), Improving the Process, Civil Engineering, Vol. 72, No. 9, September, pp. 74-77. Spellman, F. R. (1997), Incineration of Biosolids, Technomic Publishing Co., Lancaster, PA.
U.S. EPA (1979), Process Design Manual for Sludge Treatment and Disposal, EPA 625/1-79/001. Sludge Dryer. U.S. Filter, Prospect, Dewatering/Drying Systems. Practice FD-19, Water Environment Federation, Alexandria, VA.